I hate wasting food, but I also like eating fresh food no matter how long I have to store it and so am always looking for a machine that will help me achieve both. In my search for the best vacuum sealer, I came across the Vacmaster VP120 and just by looking at its stainless steel firm body I could tell there was something special about it. And when I got to use it the results that I got from this two cylinder piston pump machine were impressive. 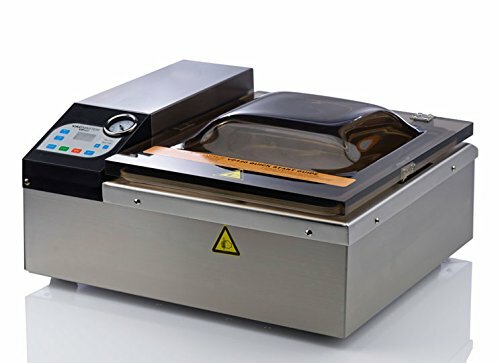 The VP120 is very simple or easy to use, and you do not need any prior experience with vacuum sealers or spend many hours reading the manual from cover to cover. You only need to power it up, and you will quickly figure out everything else. It has an auto programming feature that makes things convenient for you and also makes the sealing process faster especially when you are storing a lot of food. Comes fitted with a maintenance-free pump and it is also easy to clean due to its straightforward design. With this vacuum sealer, you can be guaranteed of tremendous vacuuming and sealing power and hence also longer storage for your foods. The convenient, transparent lid makes it possible to monitor the sealing process. It is more expensive when compared to others on the market that claim to have the same capabilities. VP120 is quite a cumbersome and bulky machine when compared to others in the market, and so it will limit its use to one particular location. High altitudes will affect the performance of the vacuum sealer.